Why MyTurn and GoCardless? The return of this sling librarians evenings? I love running a sling library. But sling library admin takes me ages. I currently typically spend between 60-90 minutes on the evening after a session doing admin. This ranges from emailing out instructions and when sling is due back, to updating renewed slings and creating my day to day working list. Then there are the text messages/email reminders and chasing overdue slings. I can do as much work after a session as I do at it. My work life balance has disappeared. So, I have been looking at ways of making things easier and less time consuming for me. But while also providing you with the same information. I pride myself on the fact that support doesn’t just end the minute you leave the sessions. This means in the last few weeks I have registered the library with two different systems. The first is GoCardless. 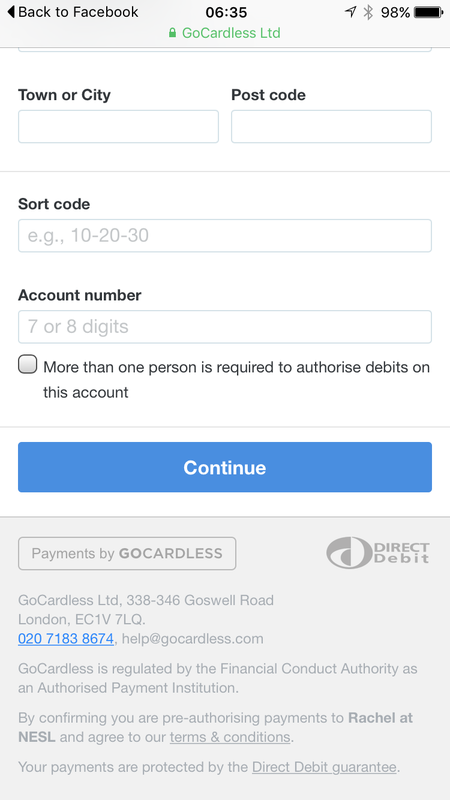 GoCardless allows small businesses to take Direct Debit payments, whether recurring or one off. All payments are protected by the Direct Debit Guarantee and GoCardless are regulated by Financial Conduct Authority (formerly FSA). I don’t see any of your bank details. By registering you grant authorisation that I can take payments in the same way as all Direct Debits. You receive an email before each patents will be taken too. This system means I can readily renew your slings. It means I don’t have to take deposits, it means you don’t have to worry if something comes up and you can’t make the session, or you simply want to renew. It is also cheaper than PayPal. I am urging everyone to sign up. I have used this system as a customer since September and find it really easy to use. I hope you will too. Please register using our details by clicking here. This is what it looks like when you sign up. 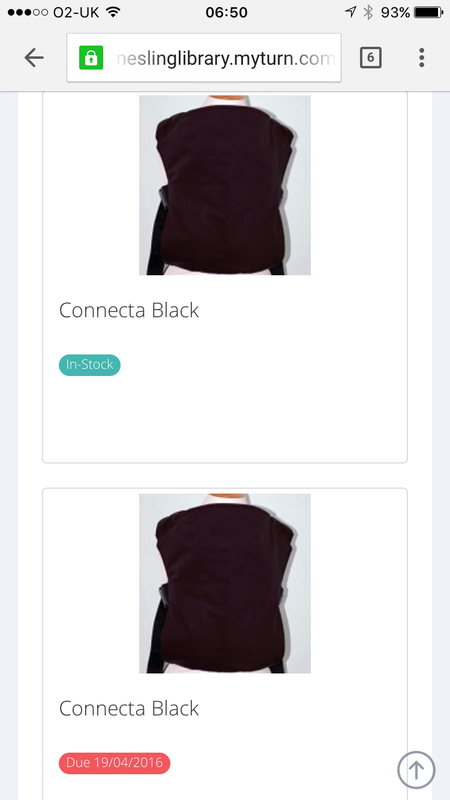 Our next development is the creation of an online inventory, with MyTurn, of all our slings (accessories will be added shorlty). This is searchable by brand, type and key words. After seeing comments by fellow sling librarians across the country I have created a NESL MyTurn page. 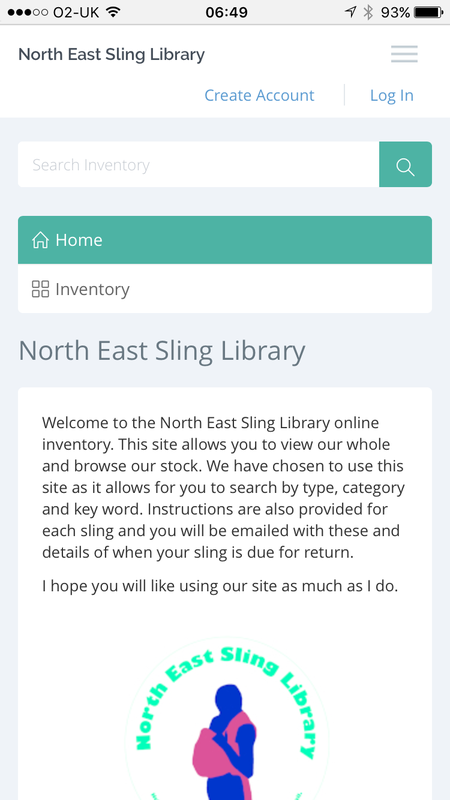 This page will allow you to see what slings are in the library and if they are Instock. It also says when they are due back (please only take this as a guide and don’t assume it will automatically come back – life with small children is never straight forward and things happen to stop people coming). Cataloging the library and now adding users is a labour of love currently. It would be really helpful if you can preregister your details by visiting this page and creating an account. I hope in long run it will be time well spent. This system works very much like a book library. You will be given an account and this will then be used so we can easily track what slings you have tried. It will also automatically email you with details of when sling is due back. 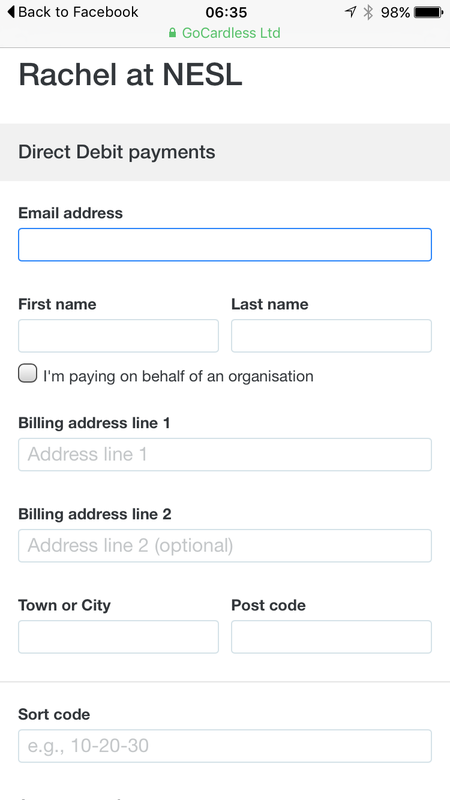 All our carriers now have instructions on their record page too and details of how to access these are also in email. It will also email you the morning before you are due to return. (MyTurn are currently developing the option to do this earlier but will be a little while). I hope you like both new developments as much as I do. Slings will of course be able to be renewed by PayPal (fee payable) and by BACS. Our website will be having a little refit with link to MyTurn being added. Any questions, just ask!